A baptism is a rite of passage that is performed mostly on children. This signifies their initiation to the world of Christianity and, according to some religion, cleanse one’s soul of the original sin. This practice is respected and adhered by millions of Christians all around the world and it is observed by the family and the friends of the parents of the child that is about to be baptized. Most of the time, the baptism day has an itinerary that begins with the ceremony and is followed by a feast of some kind or a small gathering. Your guests will want to attend the baptism ceremony, as being a part of that makes them feel like they belong in the family of the about-to-be christened child. Check out the baptism invitation templates for boys we have available for download. 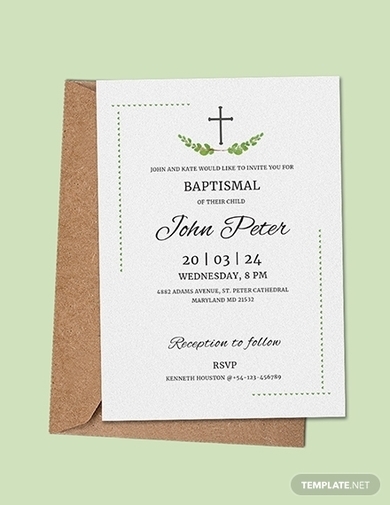 This simple, cute-looking baptism invitation card will surely catch the eye of your guests, and they will surely feel encouraged to keep this card as a remembrance when the event is over. After all, an invitation with your baby’s picture will be surely wanted and adored by your guests. 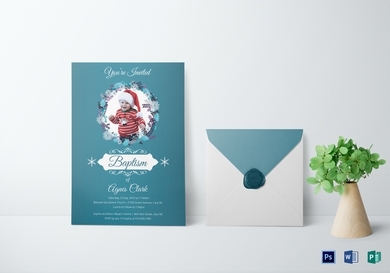 This invitation card has a blue motif, which makes it a more suitable color for a male child’s baptism. The color blue makes this invitation more soothing, calming, and most certainly inviting. Your guest’s minds will be relaxed and at ease just by looking at this invitation card. 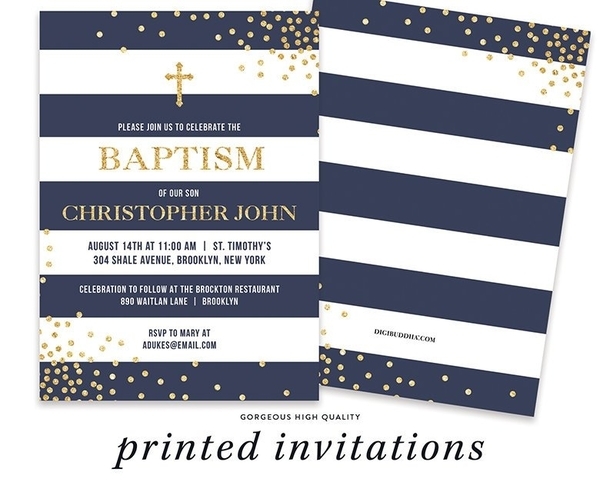 This baptism invitation card is pleasing to the eyes. Your guests will surely want to hold on to this. Covered with a red, white, and pinkish motif, this card’s color scheme makes it seem like it is exhuming with love and warmth; very fitting that those are also aspects the parents have toward their children. Who said boys can’t appreciate the beauty of the flora? Well, of course, they can. 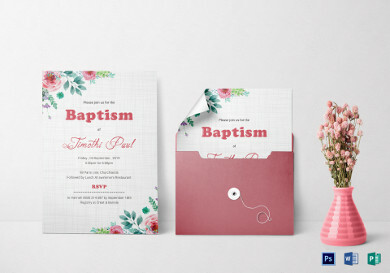 This flowery-themed baptism invitation card looks grand and beautiful. 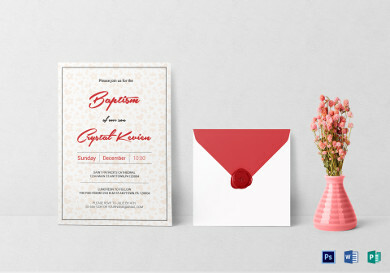 Participating in an occasion with an invitation card as pretty as this can make the guests feel a charming sense of elegance. 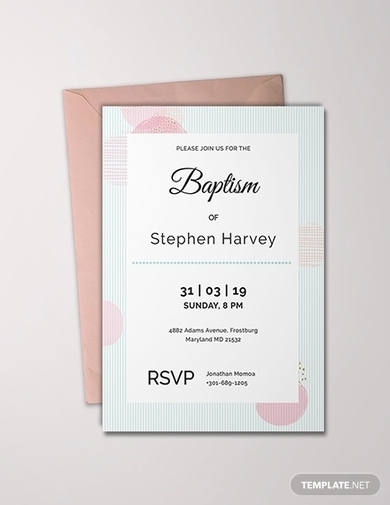 This invitation card is a little plainer compared to the others, but it gets the message across directly as it highlights the name of the child, the date and time of the baptism, the location, and contact information in case of further queries. While others can go for the designer’s approach, there is nothing wrong with being abrupt and straightforward with your invitations. Similar to the invitation card before this, this too is a very simple-looking baptism invitation card. The important thing is people remember when and where the event is happening. Such is the purpose and main outline of these invitation cards. It can also help if you use scented cards for these kinds of invitation to compensate for the lack of design. It is not necessary, simply an advice. This invitation card is very handsome looking. Just looking at it, your guests will be able to surmise immediately that the baptism they will be going to is for a male child. It also has little elements very reminiscent of the yuletide season. So if those two occasions happen to coincide for you, this is a great invitation card for that. 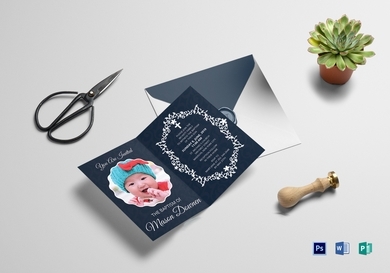 An invitation card with a photo of the about-to-be christened child. Show off a picture of your child with this invitation card. I mean, just look at that cute face, people will surely want to come to his baptism day. On the other hand, if you have friends and family members who have not met your son yet, this is a great invitation to give to them. Not only are they getting the news of being invited to his christening, they also catch a glimpse of the handsome baby boy. 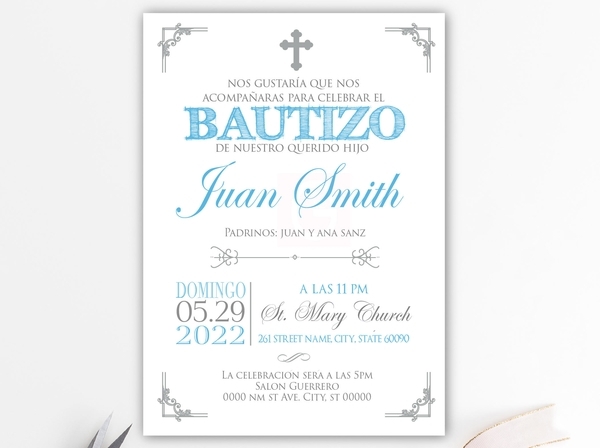 A baptism invitation card that looks more elegant and has a sense of divinity due to the use of silver lines and glowy blue texts. You almost feel holy and purified attending this particular baptism. 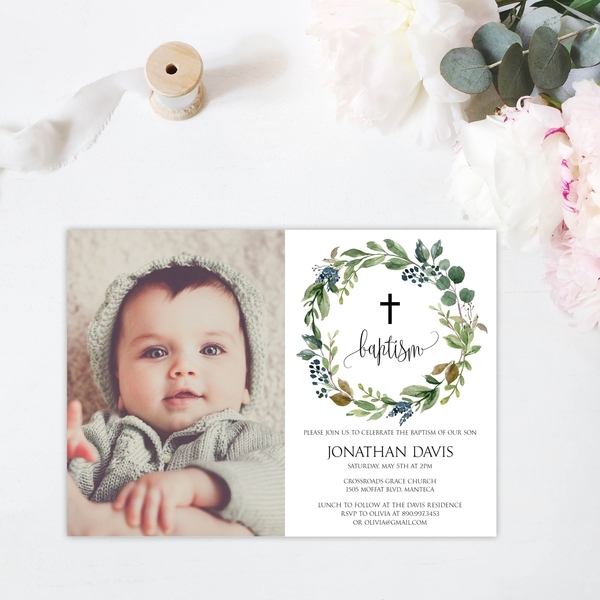 Let your son glimmer on his baptism day as guests of friends and family witness that ceremonious event, begin that scenario by distributing this beautiful-looking invitation card to your list of attendees. 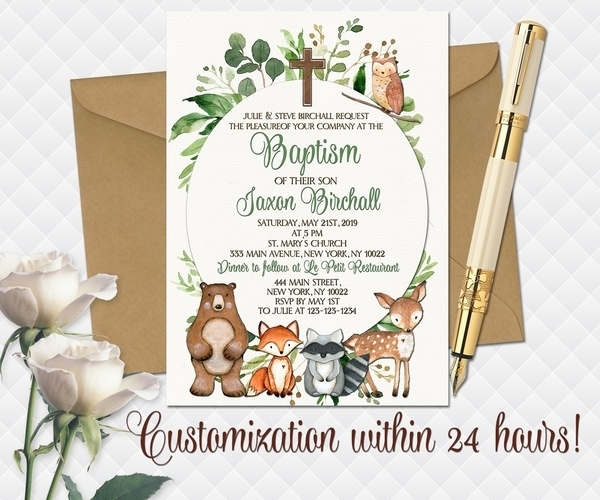 This very cute-looking baptism invitation card is customized with adorable woodland critters. Guests with an undeniable love for animals will surely appreciate this card, and attend the ceremony without hesitation. 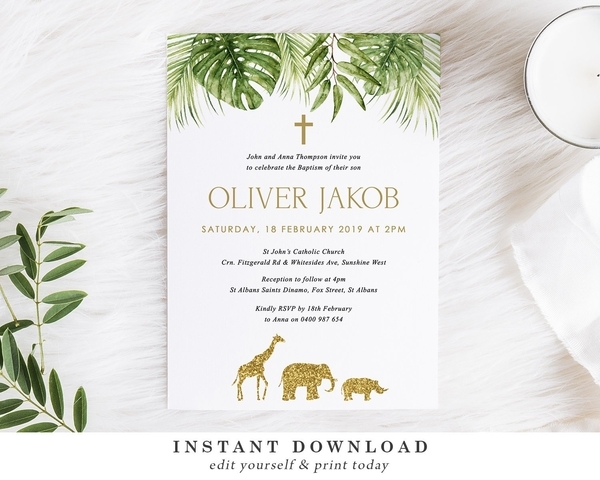 This invitation card is sort of similar to the one before it, but with a safari motif instead. This card screams might and grandeur. Perhaps this is a premonition of, or preparation for, how and what the child is going to grow up to be. The baptism of their child is one of the most important events for a family. Not only does it symbolize their passage to Christianity, but it is also a reminder that time and life passes faster than you think. It seems like it was only yesterday that they were born in this world. Soon, you will be celebrating your child’s first or next birthday (depends on how old you decided to baptize your child), then you will be sending them off to school. Time flies fast, but events and memories like these will linger forever. Make sure you have the most important people in your life with you when those moments come by. Begin your son’s life in a great way by baptizing them, and have your friends and family there to bear witness on this joyous moment.